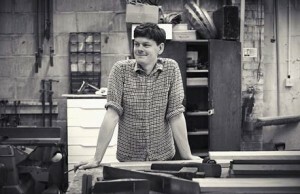 Steady-On Designs are a small Brighton based furniture making workshop. They design and build modern handmade pieces of furniture, specialising in solid wood in a clean, contemporary style. They have been at Rodhus since spring of 2011, and occupy the ‘dirty, noisy’ part of the factory. As well as developing a range of furniture and products they also provide a bespoke service to the general public, plus consultancy and prototyping for other businesses. They have a lot more information at their website: www.steadyondesigns.co.uk, and you can keep up to date with all the Steady-On news by following them on Twitter http://www.twitter.com/steadyondesigns.